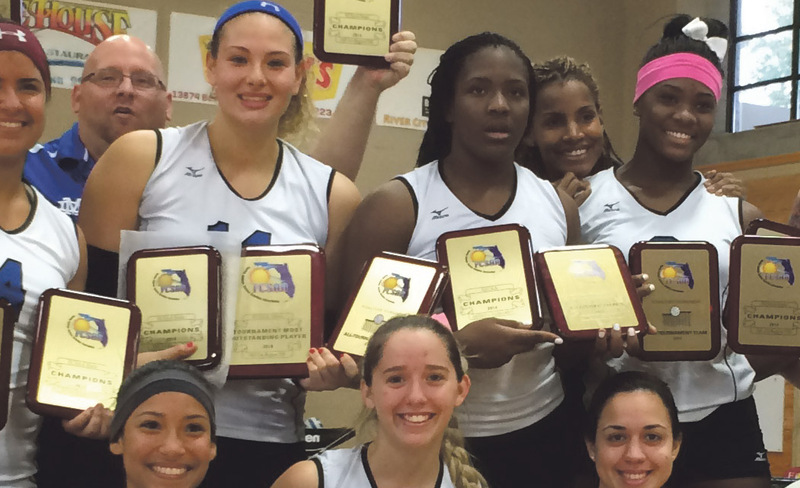 MIAMI,FL — Miami Dade College’s (MDC) women’s volleyball team claimed the National Junior College Athletic Association (NJCAA) District/Florida College System Activities Association (FCSAA) State Championship title this week. This is the Lady Sharks’ 42nd state championship. They currently hold eight national championships. They defeated State College of Florida-Manatee 3 to 0 over the weekend, improving their record to 27-3 this season. Eirini Chatziefstratiadou was named Most Outstanding Player of the Tournament and was named to the FCSAA All-Tournament Team, along with Katie Hogan, Merissa Murphy and Silvia Galeano. This week, the Lady Sharks will head to Casper, WY to compete in the NJCAA National Championship Tournament. MDC’s Department of Athletics prides itself in the sponsorship of academic development and promotion of sports. MDC teams have earned a total of 34 NJCAA titles, including 13 in women’s sports. The intercollegiate athletic program at MDC works in partnership with its dynamic, multi-cultural community to provide accessible and high quality guidance and direction by keeping the needs of the student-athlete at the center of decision-making. For more information, contact MDC’s Sports Information Director Antonya Pharr at 305-237-2753 or apharr@mdc.edu.